Fannie Mae and Freddie Mac’s combined inventory of foreclosed residential property has quadrupled in just three years and now stands at a record $24 billion. The number of properties on their rolls -- now at nearly 242,000 -- has increased fivefold. That’s roughly a third of the total U.S. portfolio of repossessed homes. So far, Fannie & Freddie have been holding those foreclosures to not flood the real estate market. With foreclosures projected to increase 20% in 2011, eventually they are going to have to sell those foreclosed properties, which will cause home prices fall. On top of Fannie & Freddie there is a glut of shadow inventory, all being held back to avoid the inevitable foreclosure dump. Bottom line, housing prices must fall and you can't pay for a house when don't have a paycheck or a shrinking one. Now, Banks want to securitize mortgages held by the GSEs, yes those derivatives which caused the financial crisis, plus have the government guarantee them. The Banks have set their lobbyists upon this socialize the risk, privatize the gain Freddie and Fannie agenda and notice how lobbyists write white papers full of spin to met their objective of more taxpayer subsidies. We have a new estimate on the financial black holes Fannnie Mae and Freddie Mac by the Federal Housing Finance Agency. 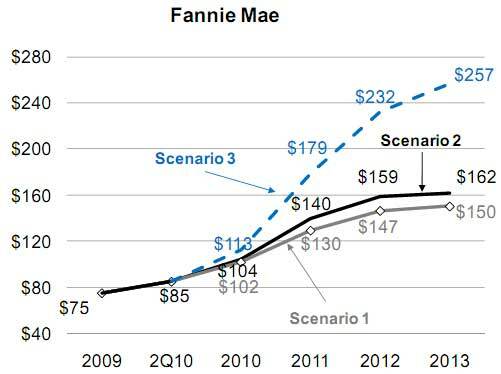 Through 2013, Fannie Mae and Freddie Mac will cost between $221 billion and $363 billion. If you haven't seen it yet, there is a rumor running around that the Obama administration will order Fannie Mae and Freddie Mac to forgive a portion of mortgage debt for home owners in negative equity. Believe this or not, Fannie Mae and Freddie Mac could cost up to $1 trillion dollars to fix. Due to current trends in the housing and financial markets, we continue to expect to have a net worth deficit in future periods, and therefore will be required to obtain additional funding from Treasury pursuant to the senior preferred stock purchase agreement. Fannie and Freddie asked for another $8.4 billion from Treasury and last month received $15.3 billion from Treasury, bringing the tally up to $92.7 billion dollars. Our estimated market share of new single-family mortgage-related securities issuances was 40.8 percent in the first quarter of 2010, compared with 38.9 percent in the fourth quarter of 2009. Our mortgage credit book of business was $3.18 trillion as of March 31, 2010. Elimination of fair value losses on credit-impaired loans acquired from MBS trusts we have consolidated, as the underlying loans in our MBS trusts are already recognized in our condensed consolidated balance sheets. Bloomberg is reporting House Financial Services Committee Chair, Barney Frank, is talking about replacing Freddie Mac and Fannie Mae with a different type of mortgage financing model. If you recall, Fannie and Freddie received quite a Christmas present in the form of an unlimited bail out, which puts TARP to shame.